RockUnitedReviews: FAITH CIRCUS: "Turn Up The Band"
Turn up the band and let it take you back to the summer of 1989... The second Faith Circus longplayer is most certainly a very vintage sounding album, but I'm not complaining because it's a throwback to a time when many of my favourite albums were released. More importantly, the band manages to sound convincing and energetic, even though they are not offering us anything particulary "new". 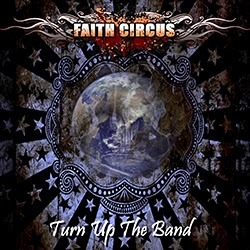 The Faith Circus sound is a very appealing mix of eighties' Kiss, Bon Jovi and Skid Row (first album) - there's plenty of melody but also a lot of raw power that makes it a bit special. The production is excellent, and the individual performances top notch. Some fine, fluid guitarwork here, not to mention Marc Ferrano's fine vocals. My favourite tracks include the superb summertime anthem "Sunshine Radio" (Blue Tears fans, take notice), the strong opener "Restless Heart" and the ballads "Tears You've Never Cried" and "Into Your Heart", both of which would have turned the bands into MTV darlings back in 1989. The only weak track is the plodding "Love Me Dry" which reminds me of Gene's half-hearted tracks on the eighties' Kiss albums. Otherwise it's all good, some better than others but thoroughly enjoyable.